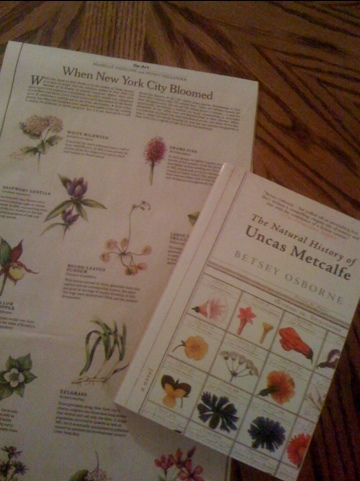 When I saw their matrix of wildflowers, I remembered the table of plant illustrations on the cover of Betsey Osborne’s “The Natural History of Uncas Metcalfe” – a novel I’ve kept on my shelf just because the layout reminded me of a quilt design. In Osborne’s novel, Uncas Metcalfe is a botany professor at retirement age, but unwilling to leave the comfort of having a familiar routine. His absent- minded professor antics are endearing, at first, with his befuddled nature and long roots in the small college town with the statue of his colonial namesake. His routine is disrupted by his wife’s illness and his daughter’s return home; his comfortable existence is suddenly threatened. The turning point of the story comes when a former student forces him to see all that he has missed. With a Virginia Woolf style, Osborne takes aim at the ivory tower, a life limited to small boundaries, and a mind not willing to let others in. But it’s the cover I still like best. This entry was posted in art, book review, books, essays, news article, places to go and tagged Betsey Osborne, blooms, botany, New York City, The Natural History of Uncas Metcalfe, wildflowers. Bookmark the permalink.